Valentine's Day is just around the corner. So I've gathered some of my favorite ideas to give you a little last minute inspiration if you've been looking for ways to make the holiday special for your family. First print, cut and fold special messages to your family members. It's more fun if they are specific for each person. Then take a regular fortune cookie and wrap it in a damp (and clean) cloth. Microwave it for 30-60 seconds, depending on your microwave and how damp your cloth is. It should then magically unfold enough for you to grab the old fortune, trade it for your own and then reform the cookie back to its original shape...which you must do with ninja speed and delicacy before it hardens again (be sure to have your new fortunes ready). It's actually pretty much the coolest. The only thing that is really tricky is keeping track of which cookie is for who, because it loses all cool factor if someone gets the wrong personalized message. Be sure to watch the recipients faces as they are read! You can also find mini take-out boxes at Michaels to present your masterpieces in. Set a pretty breakfast table the night before (and after the kiddies are in bed). It's a fun surprise in the morning. Don't worry about getting too fancy, just gather items from around your house. And a banner is always a festive touch. Then serve up a themed breakfast before you send your sweet angels to school (they are sweet angels right?). 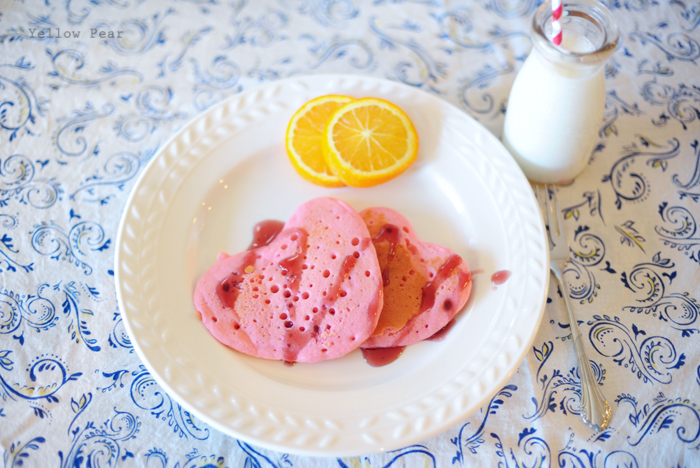 You can't go wrong with pink heart pancakes, berry syrup and striped straws. 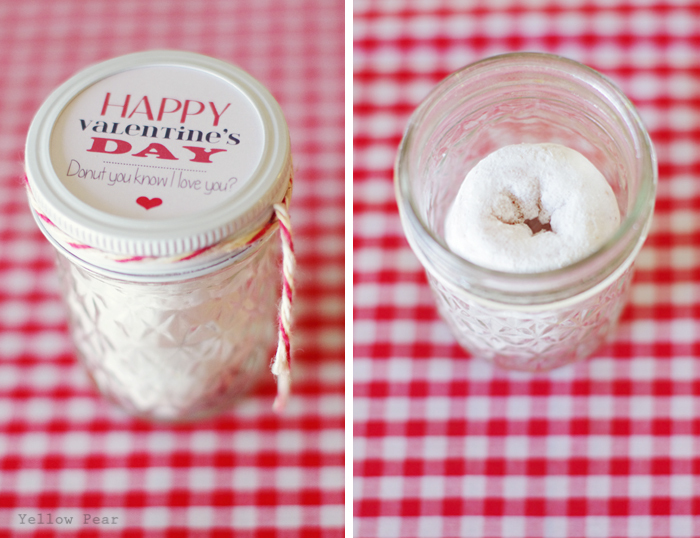 Stack powdered donuts in a mini mason jar and attach a "Donut you know I love you" card to the top. Download your free printable below. There are two versions...just because I couldn't decide. Plus I like you. You could also attach the printable to individual donut packages with baker's twine. 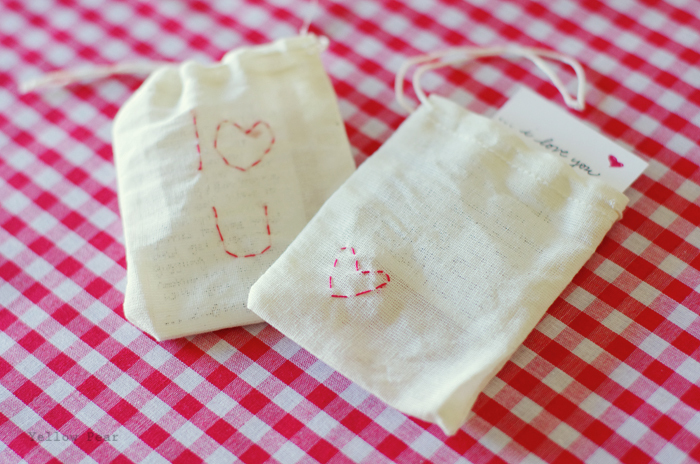 Embroider herb sachets (bought from Bed Bath and Beyond) with simple hearts and messages (seriously...very simple). 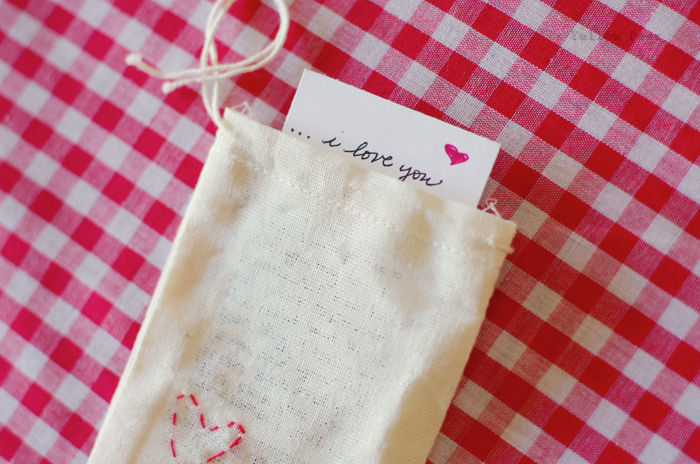 Write a sweet love note for each family member and slip it inside. Be sure and pencil your drawing before embroidering to help with normal-looking hearts. I didn't and should have because I had to redo it a few more times than I would have liked. Fondue is a fun, interactive way to make Valentine's dinner a little more special when you are celebrating at home with the family. I've included our favorite recipes. We use a nice bread like ciabatta or French bread and/or green apples and grapes with the cheese fondue. And although I try to use the apples for healthy purposes, the bread is BY FAR and hands down... my favorite. The recipe also recommends dipping small, roasted potatoes, which sounds yummy but I have yet to try, because as I mentioned, I can't get over the bread/cheese combo. It does get messy but it is completely worth it. Melt 2-3 Toblerone bars and add cream to desired thickness...remember to stir constantly to keep smooth. We like to dip bananas, marshmallows, strawberries, Rice Krispies, pirouette cookies, wafer cookies, and I am sure there are about a gazillion other options. Happy Valentine Planning! I am off to print cards for Dennis and Q and prep for our yearly Valentine's Breakfast. Also I am avoiding laundry and mopping today. Toodles. Ok I can't wait to hear what you did! And I love Valentine's Day so I make time. :) It's all about what you WANT to do...so maybe the laundry piled up and maybe my closet isn't looking so hot...but hey, I can get to those later, right?! Love all of these!!! You're awesome! Thanks Lori, you're pretty awesome yourself! :) I sure miss hanging out every now and again...and talking shop!